Each year, the UK Government spends around £242 billion on goods and services and thousands of suppliers just like you are getting a piece of the action. 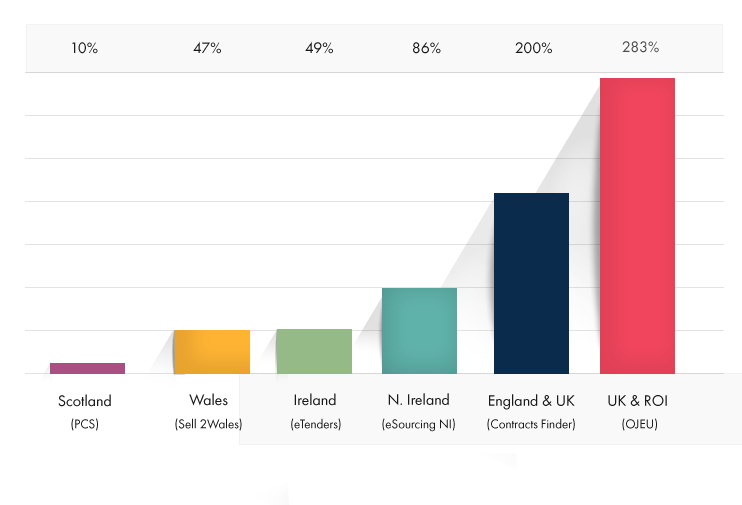 Super-powered by our database, which is the UK and Republic of Ireland’s largest database of public sector contracts and is researched from over 3,000 sources (we publish more opportunities than even the Government’s own national contract services! ), we put all our contract information in one simple to use place for you. What’s more, we offer a free local area subscription and flexible coverage expansion options that start from as little as £25 per month. How can Supply2Gov help your business? We offer flexibility, allowing you the freedom to pick and mix the tender plans that are right for you. Our local subscription allows you to get started for free and pay as your business coverage needs grow. You don’t have to choose the area your business is based in – you can pick the area you are most interested in supplying to. Supply2Gov is built to let you choose exactly what you need for your business. Start with a free local area and upgrade to Country, multiple Countries, UK, Republic of Ireland or UK & Republic of Ireland at any time.